The journey down a track to peace isn’t always straight in Athol Fugard’s newest play, The Train Driver, receiving its East Coast premiere at Long Wharf Theater. Set in South Africa, the play explores the guilt and redemption of Roel Visagie (Harry Groener) as he searches a cemetery for “those with no names” in the hope of discovering the grave of the woman and baby he hit while driving his train. He needs to yell at her for ruining his life. And why did she just walk out in front of the train like that? He needs to put things right and find some peace. Roel’s relationship with his wife and children has suffered, he’s lost his job and no one ever claimed the victim’s body for funeral. Helping him sort through his emotions and find some closure is Simon Hanabe (Anthony Chisholm), the kind-hearted grave digger who lets Roel sleep in his shack while he searches the graveyard and his soul. Simon buried the woman and her child, but can’t remember exactly where in the vast, sandy graveyard (nicely created by set designed Eugene Lee and dramatically lighted by designer Christopher Akerlind who recreates the sadness of Roel‘s heart and the shadows haunting him in an almost tangible way). Roel, oblivious to the danger from gangs and dogs who roam the area at night, rearranges the rubbish and stones Simon uses to mark the graves into crosses to give so many souls “without names” more proper final resting places. Long Wharf’s Artistic Director Gordon Edelstein directs moving performances from both actors. The play, heavy on Roel’s monologues while Simon listens, tends to be tedious in places (imagine someone talking almost non stop for an hour and a half) and Fugard extends the ending beyond the natural conclusion to force more drama, but overall, The Train Driver is a thought-provoking piece about peace and the stations through which we must pass to reach it. Roel is a good man who wants to do right by the woman and God and we like him and feel for his plight -- all elements of a good story that stays with you. 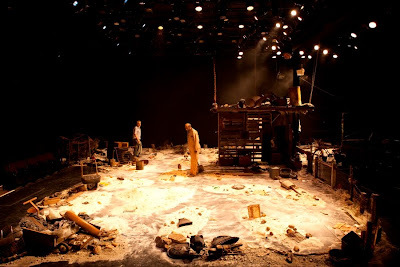 The Train Driver pulls in at Long Wharf’s Mainstage, 222 Sargent Drive, New Haven through Nov. 21. Performances are Tuesdays, Wednesdays and Sundays at 7 pm, Thursdays, Fridays and Saturdays at 8 pm with Wednesday and Sunday matinees at 2 and Saturday matinees at 3. Tickets are $45-$70 with special discounts available. Call 203-787-4282 or visit http://www.longwharf.org/.